Alison Marsden, a UC San Diego mechanical and aerospace engineering professor, has developed breakthrough simulation tools to assist pediatric heart surgeons. San Diego, CA, February 9, 2009 -- Congenital heart defects account for five times more deaths annually than all childhood cancers combined. Alison Marsden, an assistant mechanical and aerospace engineering professor at the University of California at San Diego, has developed a unique set of computer modeling tools that are expected to enhance pediatric surgeons’ ability to perform critical heart surgery on children. 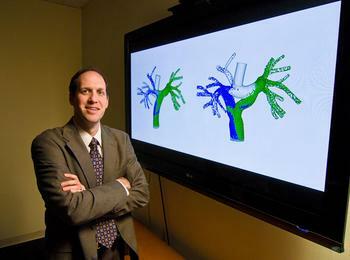 Marsden’s work focuses on designing and using simulation tools to provide a way of testing new surgery designs on the computer before trying them on patients, much like, for example, engineers use computer codes to test new designs for airplanes or automobiles. Certain severe forms of congenital heart defects leave a patient with only one functional heart pumping chamber. These “single ventricle” defects are uniformly fatal if left untreated, and require a patient to undergo multiple heart surgeries, ending with a Fontan procedure. In the Fontan surgery the veins returning blood to the heart from the body are directly connected to the arteries that send deoxygenated blood to the lungs, forming a modiﬁed t-shaped junction. This bypasses the heart on the one side so that the resulting circulation puts the single pumping chamber to optimal use. Using models derived from MRI image data, Marsden has come with a way to optimize a Y-Graft model for the Fontan procedure which can help pediatric surgeons determine whether this procedure will benefit a patient, as well as and determine how a patient’s heart will perform during moderate exercise. Marsden’s’ research findings on the Y-Graft were published in a paper called, “Evaluation of a novel Y-shaped extracardiac Fontan baffle using computational fluid dynamics,” in the February issue of the Journal of Thoracic and Cardiovascular Surgery. An advantage of Marsden’s proposed Y-Graft design is that it can be optimized or modified for an individual patient by custom manufacturing the graft portion prior to surgery. “Our goal is to provide a set of personalized tools that can be used in collaboration with surgeons to identity the best procedure for patients,” Marsden said. Pediatric surgeons at Stanford University plan to use Marsden’s Y-Graft computer models for a Fontan procedure for the first time later this year. One of the pediatric cardiologists working with Marsden is Dr. Jeff Feinstein, an associate professor of Pediatrics (Cardiology) at Stanford University with a specialization in interventional cardiology, and director of the Vera Moulton Wall Center for Pulmonary Vascular Disease at Stanford. Dr. Jeff Feinstein, a pediatric cardiologist at Stanford University, is excited about the possibilities of Marsden's new simulation tools for heart surgery on children. 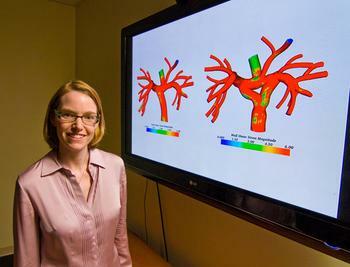 Marsden – who joined the UC San Diego Jacobs School faculty in 2007 after receiving her Ph.D. at Stanford University – hopes to eventually apply her current research and computer models to a whole range of cardiovascular diseases both in children and adults. Copies of Marsden's paper, “Evaluation of a novel Y-shaped extracardiac Fontan baffle using computational fluid dynamics,” are available upon request.